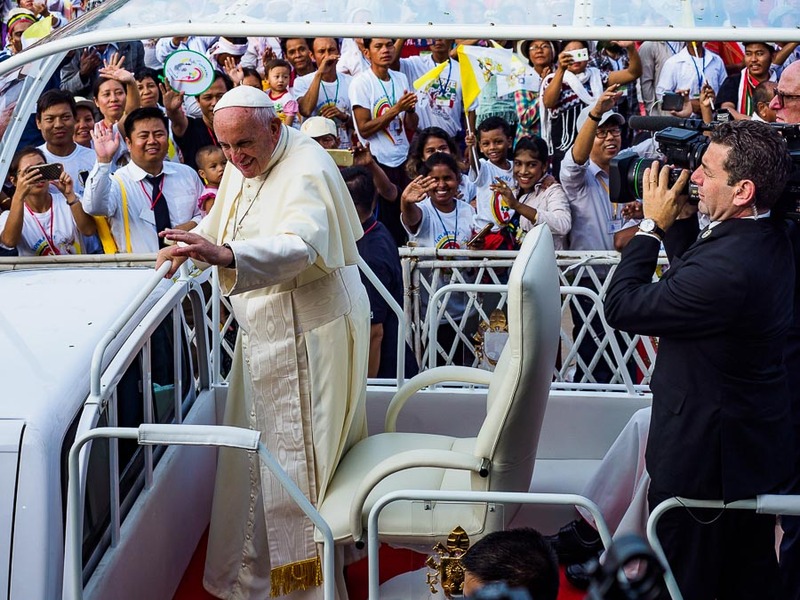 Pope Francis drives among the crowd at the Papal Mass in Yangon. Covering Pope Francis' visit to Yangon was my main reason for this trip to Myanmar. 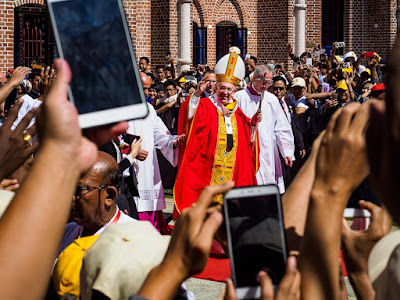 His visit was historic (the first papal visit to Myanmar) and came at a complicated time for Myanmar, still finding its way through a tricky democratization process in which the military gave up some power but it still the most powerful entity in Myanmar. 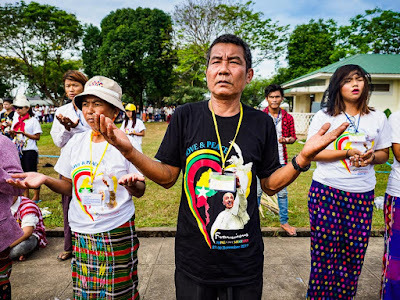 The Pope sort of invited himself to Myanmar. 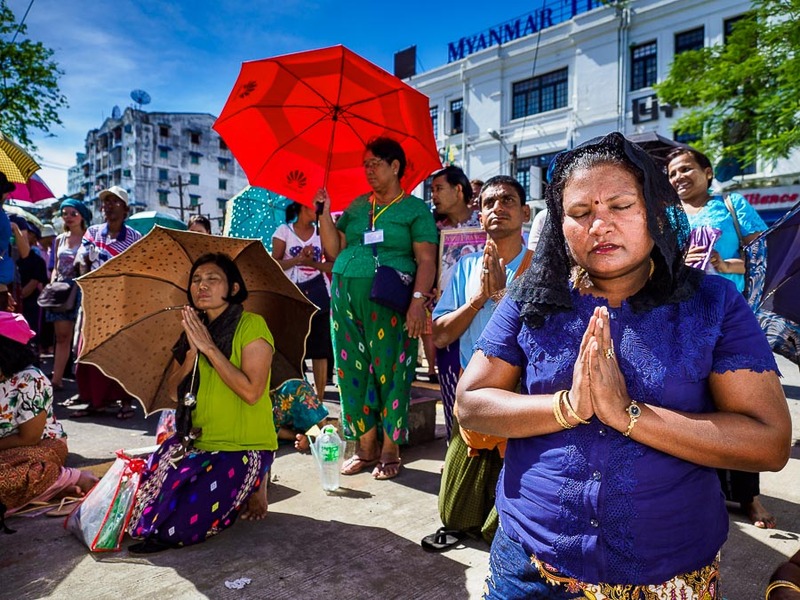 In August, when the current anti-Rohingya pogrom started, the Pope made some statements in support of the Muslim minority, whose home is in Rakhine state, in northwestern Myanmar. He also said he would visit Myanmar and Bangladesh and try to negotiate an end to the bloodletting. I think it's important to note that he wasn't really invited. The government of Myanmar didn't say he wasn't welcome, but neither did they roll out the welcome wagon. Nuns lineup near the airport to see the Pope on his arrival. There were a few hundred people at the airport, but the government did not close roads for the Papal motorcade. 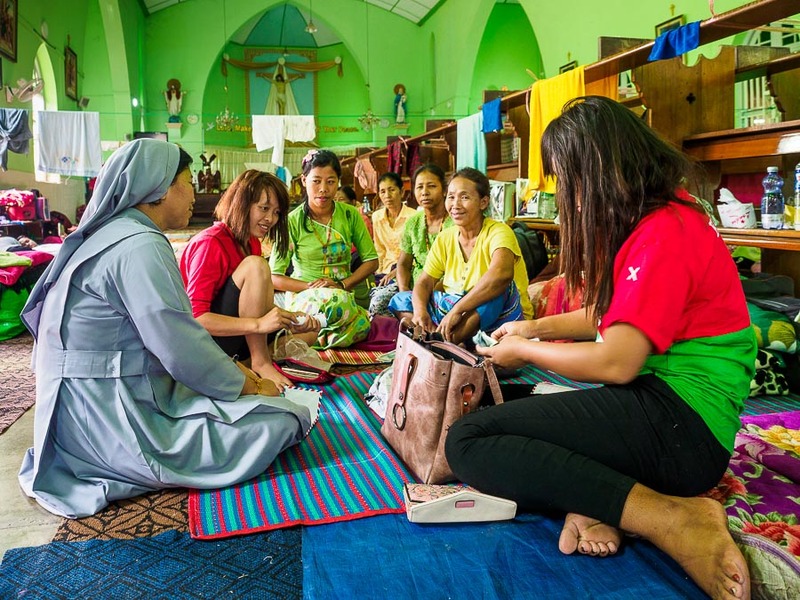 Myanmar's Catholics were excited about the Pope's visit and churches in Yangon were packed with Catholics from the countryside who came to Yangon early and slept rough on church grounds. One church, St. Francis of Assisi, hosted more than 1,500 on it's grounds. The church I went to Hwambi, had more than 500. 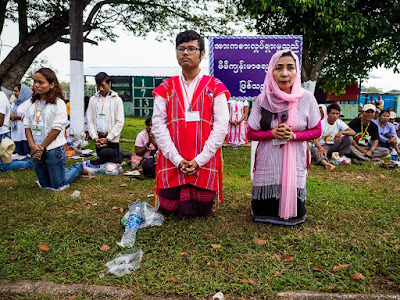 But for the government of Myanmar it was a minimum effort. 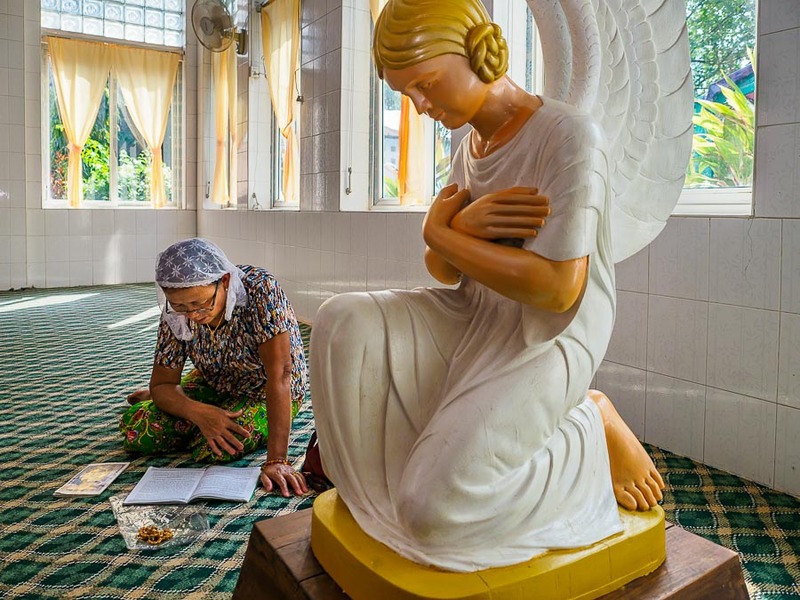 A woman prays in a chapel at St. Francis of Assisi. The sanctuary was set up as a dorm. 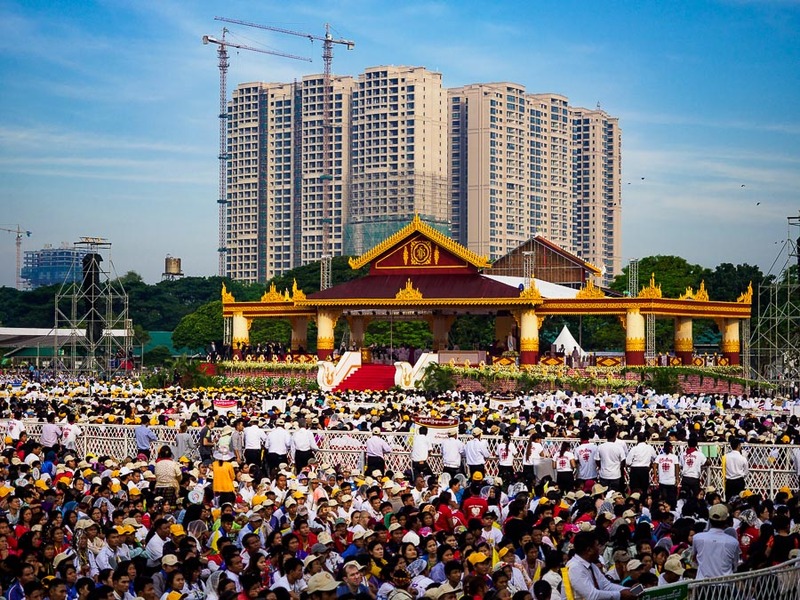 The Pope participated in two masses in Yangon. The first was at a large sports complex, on the infield of a horse racing track. 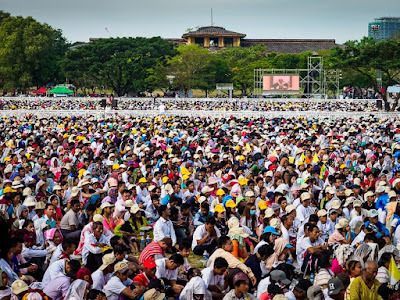 About 150,000 people are estimated to have attended the mass. There are about 450,000 Catholics in Myanmar, so the 150,000 attendees represent a sizeable percentage of Myanmar Catholics. 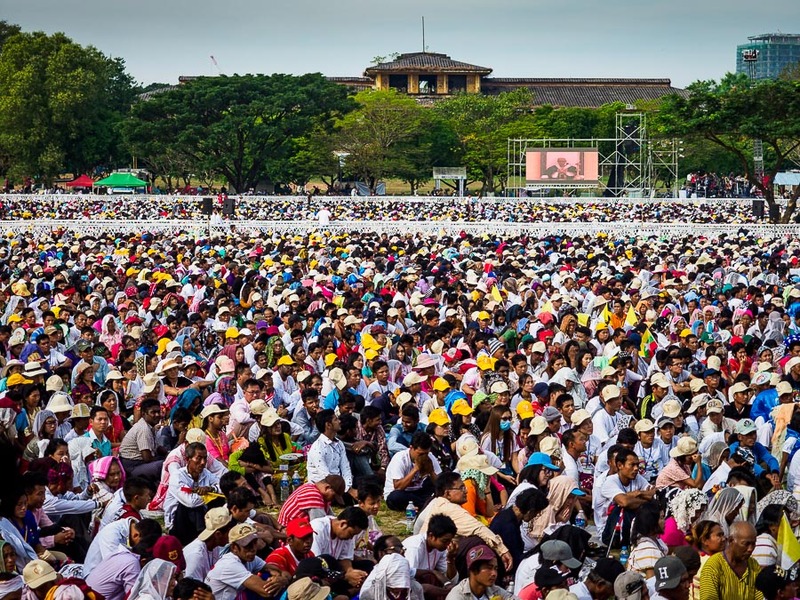 Part of the crowd at the papal mass. I had credentials for the mass, but journalists weren't supposed to leave the risers we were positioned on. Vatican press officials said the risers were 100 meters from the altar, but it felt a lot further. More like 150-200 meters. I had the equivalent of a 400mm lens and I could not see the Pope at the lectern during the homily. My view of the altar. I photographed most of the mass, then got off the riser and worked some remote parts of the mass, not in the main infield. 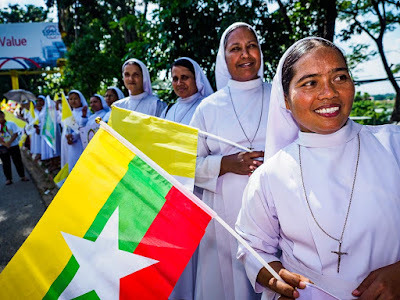 The pictures were much better and showed more of the Burmese Catholics devotion to the Pope. 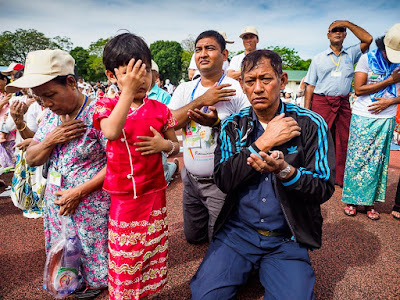 People pray in a field adjacent the mass. The Pope also said a mass at St. Mary's Cathedral. 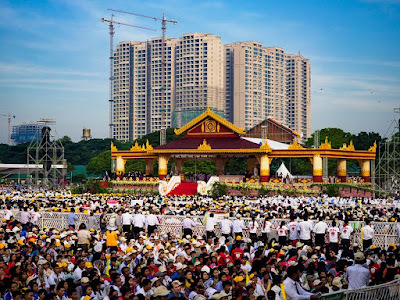 The only media allowed to cover the mass was the Pope's traveling pool, Vatican based photographers who travel with the Pope. I photographed people on the streets around the Cathedral. Hundreds of people gathered to witness and participate in the mass, but the government refused to close the roads around the Cathedral, so it was hard for people to pray or participate because traffic was roaring by. 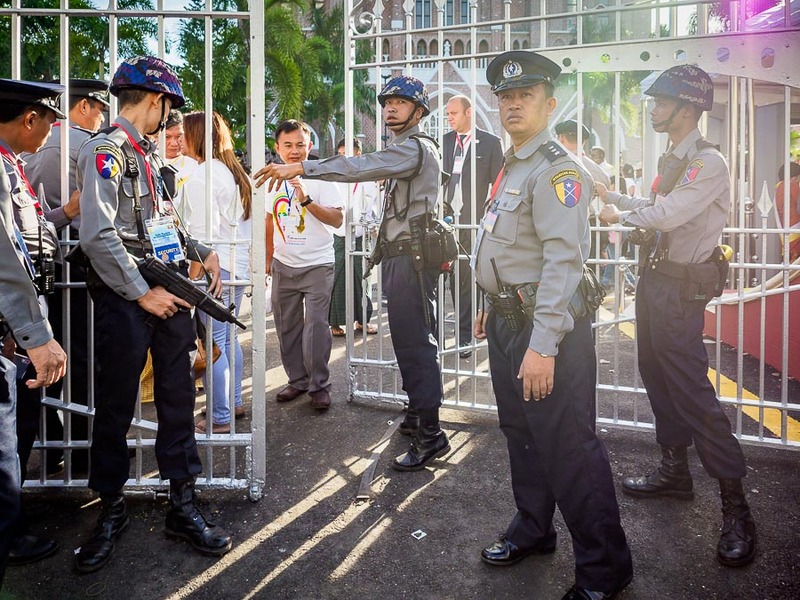 Myanmar police keep people without tickets out of the Cathedral. 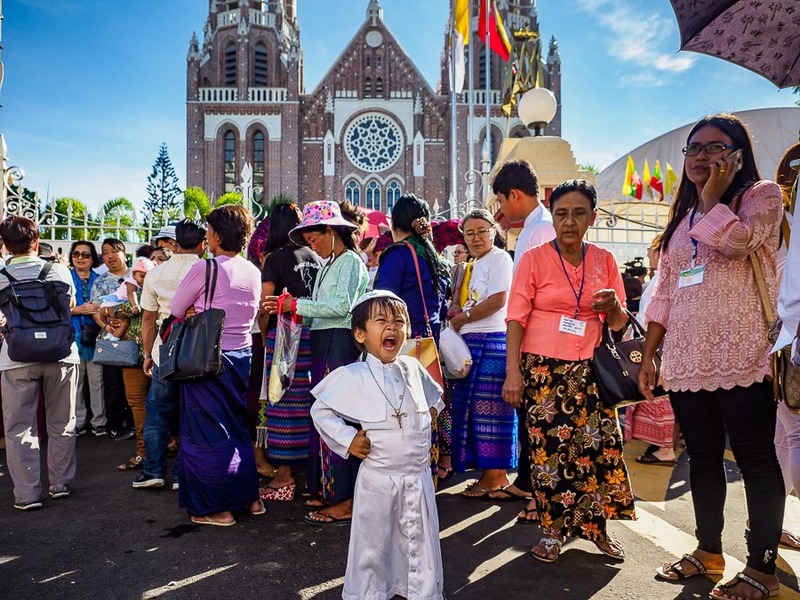 A boy in a Pope outfit in front of the Cathedral. People pray in the street during the mass. After the mass, I was able to get into the Cathedral grounds and photograph the Pope walking out. Pope Francis leaves the Cathedral. There are more photos related to the Papal visit in my archive or available from ZUMA Press.